I can’t begin to tell you how excited I am right now! The men in my life just don’t get it, and are watching me jump and squeal with looks of alarm on their faces. Pffft. This is my happy dance and I don’t care who’s watching. Can you keep a secret? I have this little addiction that I’ve been trying to curb because it gets so expensive. Have you ever eaten ginger chews? Spicy, chewy, tummy-warming ginger chews? I buy mine at the local health food store, and can easily wipe out the handful of candies that come in the box before I even make it home. I love, love, love them. And yet, I could never find a recipe for them. When I have a recipe idea in my head but don’t know where to begin with the ingredients and measurements, I do what every other person with a computer does: I Google it! I find several recipes, get a general idea of how they’re made, and then experiment until I make it my way. But no matter how hard I hunted, I couldn’t find one single recipe that sounded right. I tried one that seemed to have potential and ended up with a ginger hard candy. A very good ginger hard candy…but I wanted chewy. With bits and pieces from many recipes, and my last piece of ginger root, I crossed my fingers and finally met with success! Take THAT, Google! I’m not claiming that they’re healthy. 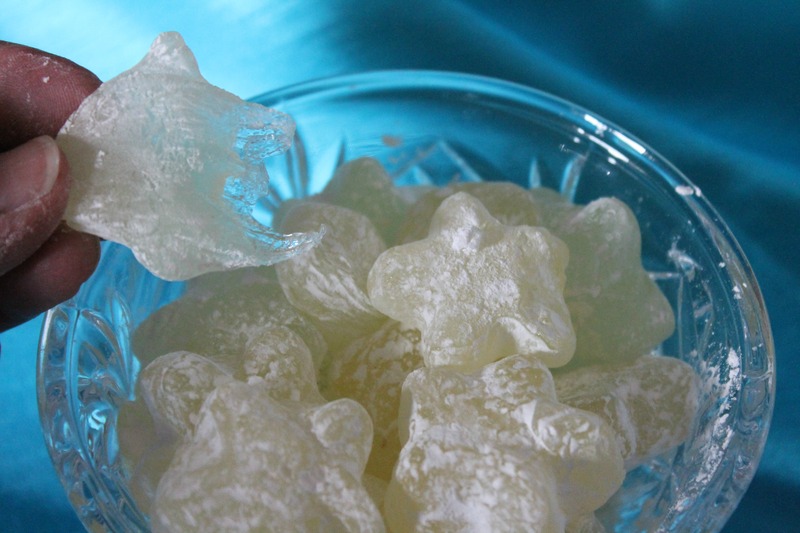 I plan to try a batch using agave or honey in the future, but these are basically sugar and ginger, and I.Don’t.Care. Disclaimer: An hour after I posted this recipe I made yet another batch (thank goodness for frozen ginger juice) because the guys said it wasn’t chewy enough. An additional tablespoon of cornstarch and 5 more degrees made all the difference! After the chews have sat out for 12 hours they are very firm, but after a minute in your mouth they soften up. If you prefer your chews softer, only use 1 tablespoon of cornstarch and bring the mixture up to a temperature of 260 F.
You may have to play with the recipe a little. Your altitude and your thermometer may be a little different than mine. Start by making a half batch and see how it works for you. Here, at a fraction of the cost of imported chews, is my recipe for Ginger Chews. Prepare a mold. You can use a pan lined with parchment paper sprayed lightly with oil, hard candy molds lightly sprayed with oil (not chocolate molds – they melt! ), or combine 2 cups cornstarch and 2 cups powdered sugar and put it in a cake pan. You can adjust the amount if you want deeper molds. Make holes in it with your finger or spoon handle, or press designs with small objects. In the photos, I used a star-shaped ice cube tray. Juice the ginger root. I use a food processor and process the ginger, skin and all, stopping to stir it several times. You could also scrape the ginger root with a spoon to remove most of the peel, and finely grate it. 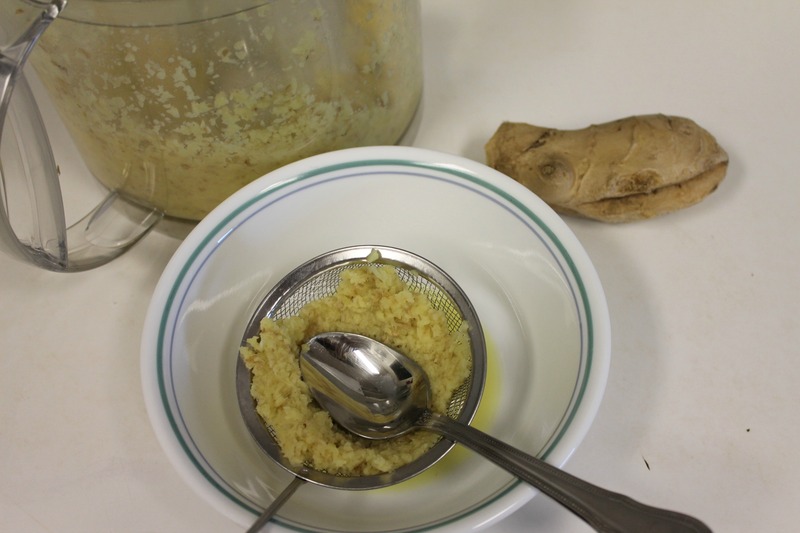 Place the processed or grated ginger in a small sieve and press out the juice with a spoon. The quantity of juice will vary depending on the freshness of the ginger. Extra can be frozen for another time. 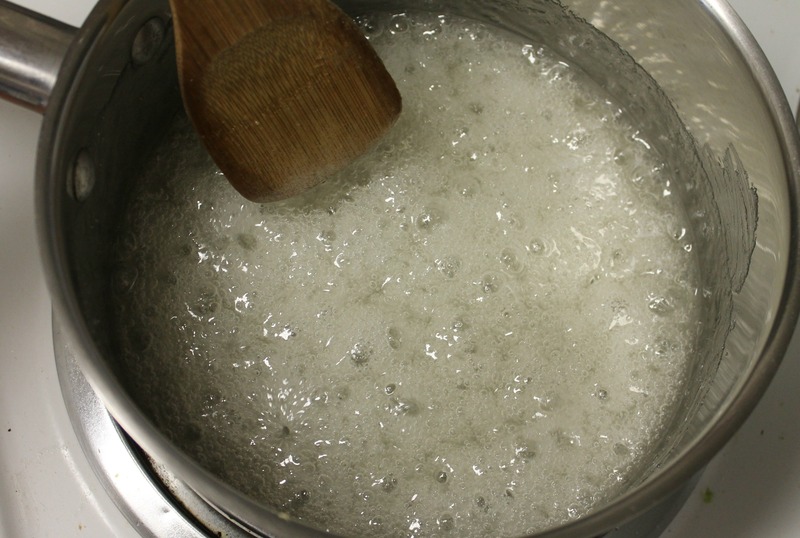 In a medium saucepan combine sugar, corn syrup, and cornstarch. Turn the heat to medium. 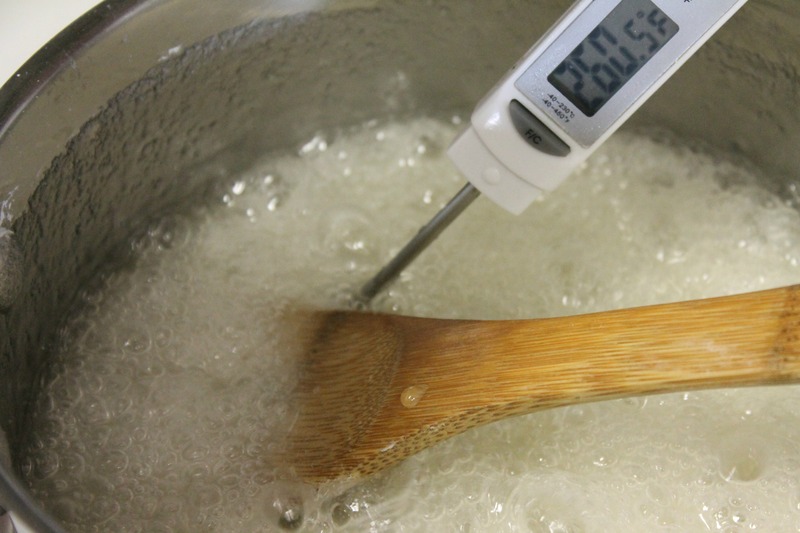 Stirring often, bring the mixture to a boil and watch the temperature carefully, using a candy thermometer. When it reaches 265 F, remove the pan from the heat and gradually stir in the ginger juice and grated ginger (if you like it very spicy). Be careful and use a long spoon! It will sizzle and spit while you're stirring in the ginger juice. Pour into the mold of your choice. 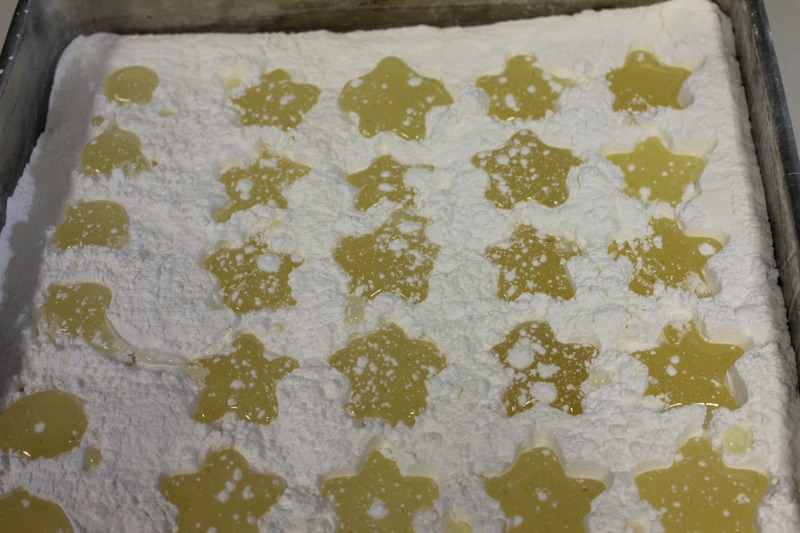 If you are using the cornstarch/powdered sugar method, pour carefully into each cavity. Pour any extra onto a lightly greased piece of parchment paper. Sprinkle with some of the cornstarch mixture, if desired. Allow the candy to sit for several hours to firm up, then dust with cornstarch and wrap each piece in a square of waxed paper or parchment. Bring mixture to 265 degrees…almost there! Poured into cavities in cornstarch and powdered sugar. 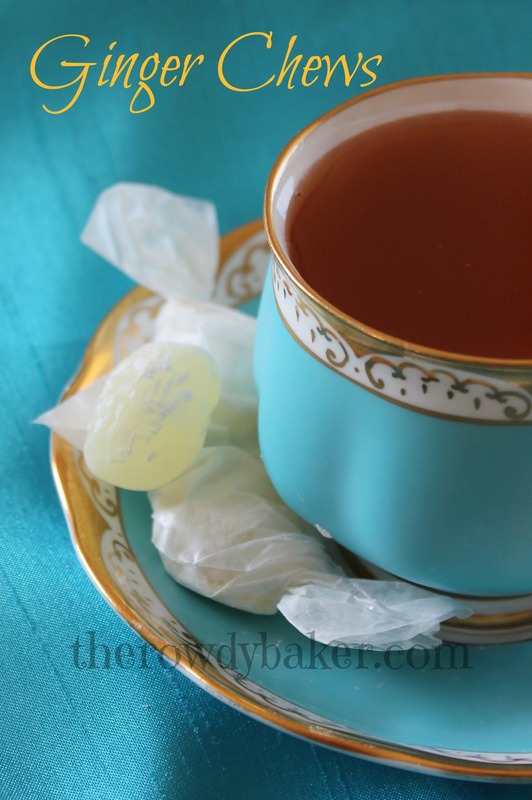 Whether you eat them as an aid to digestion, to curb seasickness or morning sickness, or just because the hot gingery taste is amazing, these little candies will hit the spot. Excuse me while I go gloat. This entry was posted in candy and tagged chewy candy, chewy ginger candy, ginger candy, Ginger chews, homemade ginger candy, homemade ginger chews, make ginger chews by Lorinda. Bookmark the permalink. More for me, Mary Rose! 😀 Thank you! I’m sure you’re not surprised that I don’t own a candy thermometer. I DO think you should sell, box and ship these for the kitchen-impaired. Karen, Karen, Karen…they’re really inexpensive, you know. I broke mine last week and had to use an instant-read thermometer for this, I think I’ll get two this time so I have a backup! These are SO simple to make! Half hour, start to finish. Honest! Ginger martinis??? I want to live with you! Check out my personal page – someone left a recipe for homemade ginger liqueur. Mmmmmm. yum I love ginger, these look great. Last time I tried to make some sweets it was a total fail, I will have to give it another go with this recipe. I can’t stop eating them! Hope you have more success with these – and thanks for the visit and comment! Every time I make them I have different results – they’re always good, but yes, I’ve had some that crystallized a bit with time. There are so many factors to question…stirring technique? humidity? temperature? I haven’t made these for a while, and really should put some on my Christmas candy platter! Thanks for the reminder! Has anyone tried to make these with honey instead of sugar and corn syrup? good idea…I think a good replacement and may make the chews less likely to crystallize. (though that’s what the corn syrup is supposed to do). The honey may help keep the candy moist and chewy. I meant to try the honey idea, but got distracted. For about 3 years. I’ll put it on my list of things to try SOON. Thanks for the reminder, Franky. I, too, would like to know if you have tried the honey. I am allergic to corn and corn syrup is the worst for me, so would really like to know of a healthier alternative. Thanks for the recipe otherwise! Crystal, I haven’t tried it. I meant to . . . just never did. As soon as I can get to a grocery store for some more ginger, I promise I’ll give it a whirl! 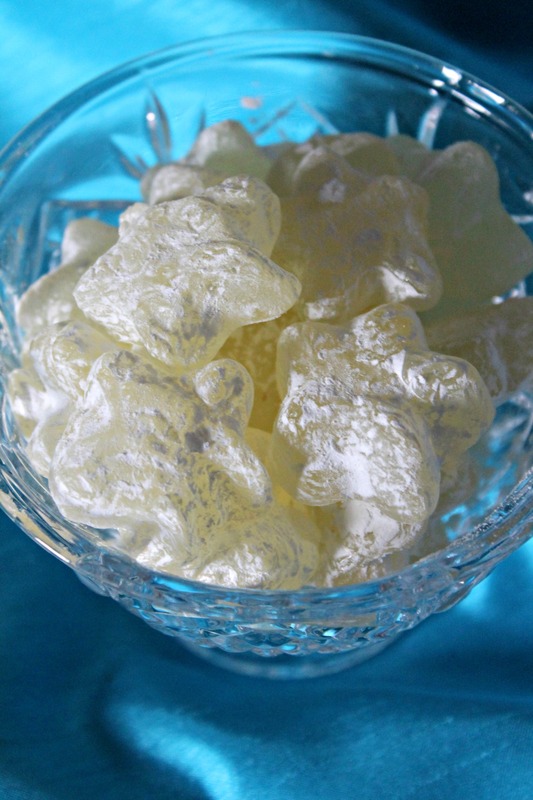 I was just ready to order a caseload of ginger candy chews online when I thought to google….thank you for this recipe! I started eating ginger after a long illness with vertgo and nausea. Ginger chews really helped me! They were also absolutely delicious and I still crave them. Where do you buy “frozen ginger juice? ” I have a ginger grater, plus a “bullet” juicer, but never saw frozen ginger juice in any store. Love your easy molding idea too. Can’t wait to try this! Hi, Mary Anne – thanks for coming by! I actually froze extra ginger juice when I was working on different ginger recipes. I don’t think you can buy it – at least, I’ve never seen such a thing. It’s good to have in your freezer, though. Just break a little bit off and add it to tea or any recipes that could use a little excitement. Let me know how it goes for you! Thank you for giving me the only decent ginger chew recipe I am able to find on google. After devouring two bags of ginger chews from the shop and finding out the price I need to make my own, I will probably keep the ginger growing industry in work for quite a while. I love anything ginger, and these are the ultimate treat. So thank you again, your recipe is going to be used in my house after I have been to my local Chmminese supermarket. So glad to meet a fellow ginger addict, Steph! And thank you for commenting; you made my day!